Ron A. Sebastian (b.1945) holds a name, GWIN BUTSXW (Likes-to-be-Packed) in the House of Spookw, Lak Gibuu (Wolf) Clan. One side of Ron's family is Gitksan and the other side is Wet'suwet'en. Ron was raised and lives in the village of Hagwilget. 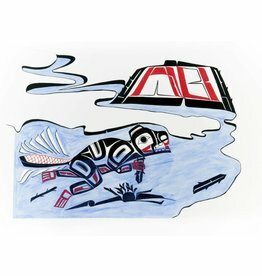 'Beaver Lodge' print by Ron Sebastian (Gitxsan). 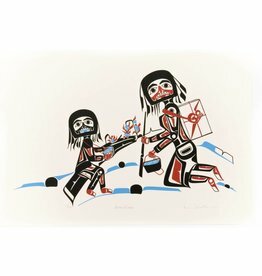 'Berry Pickers' print by Ron Sebastian (Gitxsan).